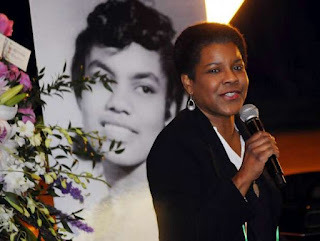 My mother, civil rights activist Patricia Stephens Due, died on Feb. 7, 2012 after a long struggle with cancer. We also wrote a civil rights memoir together, Freedom in the Family: a Mother-Daughter Memoir of the Fight for Civil Rights. In 1960, she made history as a part of the first Jail-in in the student sit-in movement. "History belongs to those who write it," she often told me. These were my remarks at her memorial service in Tallahassee, Florida. She was a student at Florida A&M University at the time of her landmark arrest. To me, Patricia Stephens Due was..is…and will always be Mom. Once, my junior high school science teacher confided to a colleague that Patricia Due was one of the most intimidating women he’d ever met. Heck, she scared me too. When I had bad news for Mom, instead of telling her in person, I preferred to write it in a note—a habit from childhood that persisted even after I was an adult. In junior high school, I was so scared to tell her I’d broken one of her dinner plates that I went out back and threw away the evidence in the canal behind our house. But anyone who knew Mom understands that beneath her gruff exterior lay the best ally you could hope for. When I sketched my first little book when I was four—stick figures and captions I called “Baby Bobby” –Mom Xeroxed it to give out to our church members and anyone else who would have one. When I became a published author, Mom was my manager who toured with me and made sure my needs were protected. She was cautious and watchful. Mom refused to cut moral corners. Her honesty pervaded every aspect of her life, from the way she taught her children to the way she conducted herself in her daily walk. She did not believe in the gray area between right or wrong, and she taught us that we must find ourselves on the right side of any ethical line. She lived what she preached. How fitting that we’re meeting here on the campus of Florida A&M University, the institution where my mother truly found her voice. Here on this campus, my mother came to know herself and her purpose. As I tell my students, she didn’t set foot on this campus knowing she was extraordinary. She came to get her education and play her trumpet, and she got in a little bit of trouble along the way. But then came the CORE and the civil rights movement and my mother’s REALIZATION—not a decision, but a REALIZATION—that she could not be still, she could not be quiet…that she was a warrior. I was born at the FAMU hospital, but I did not know Mom during that time. What’s amazing to me is that we could hear testimonial after testimonial about what she accomplished outside of our home—when my sisters and I know that to Mom, her family came FIRST. She gave so much to us, and had still more to give to the world. Mom always said that she’d witnessed too many families suffer under the weight of the struggle, and she was determined that was not going to happen to her girls. That was her staunch belief: you give to your family first, the world second. She came to every meeting, every recital. She stretched herself every day to give us the best upbringing she could. Sometimes she was “Hello, darling” and sometimes she was “Bring me the belt.” But we always knew we came first. She was at my side when I first held my newborn son, Jason, in my arms. There is hardly a single meaningful moment in my life when my mother was not there. Perhaps that was her greatest gift to us: She gave us the freedom to be ourselves. She told us we never had to be the best, as long as we did our best. She told us we would have to work twice as hard to get half as far. She taught us to love all people. She taught us to stand up for what we believe in. She taught us to love books. She taught us to love ourselves. She filled our house with black dolls so we would see our own faces reflected everywhere. She read us books about Dr. King, Harriet Tubman, Frederick Douglass and Sojourner Truth. She taught us “document, document, document.” History belongs to those who write it. And she told us stories. She didn’t tell a story once or twice. She told a story ten times—twenty times. She told a story so you would remember it. She talked about her childhood in Gadsden County, and how she and her sister, Priscilla, dodged farm work in their grandfather Richard Allen Powell’s fields. Or chased snakes. She talked about her adolescence in Belle Glade, and how her stepfather, Marion Hamilton, taught students from the area known as “The Muck” how to play Count Basie and John Philip Sousa. She told us the stories of the foot-soldiers. Of the teargas. The protest marches. She told us about the Rev. C.K. Steele and his wife Lois, and their sons Charles Jr., Henry, and Darryl. She told us about Mrs. Mary Ola Gaines, the Tallahassee housekeeper who was arrested and lost her job because she dared to sit beside the students. She told us about my godmother, Judy Benninger Brown, and Dan and Jim Harmeling. Many of those stories we put in a book, Freedom in the Family: a Mother-Daughter Memoir of the Fight for Civil Rights, which I’m so grateful we were able to write during her lifetime. She told me stories, but the woman I knew was Mom. Our last major outing with Mom was in January of 2009, when my father, my sister Johnita and I went to Washington, D.C. to see the inauguration of President Barack Obama. I probably don’t have to tell anyone in this room how excited Mom was about the election of the nation’s first black president; a young man who spoke about the contributions of foot-soldiers and how ordinary people did extraordinary things. In the end, we watched from a downtown news monitor instead of venturing out in the cold, but we were on a rooftop along the parade route, so we saw the presidential motorcade. But Mom was still Mom. The next day, Dad and I went with Mom to the White House because she wanted to collect some soil to use to plant a tree for the foot-soldiers who hadn’t lived to see the day. We came with a spoon and a small mason jar looking for soft soil outside of the White House gates. This is how we came to learn that the police don’t appreciate people squatting outside of the household gates, digging in the soil—perhaps especially the day after the inauguration of the first black president. So the young police officer who said, “Hey!” when he saw us was not polite when he asked us to get up and move on. “Move—NOW,” he in his I’m-guarding-the-White House voice. Some of you in this room may know where this is going. Mom was kneeling when he said this, and she wasn’t in a hurry to stand back up. She started trying to explain why she wanted the soil. The police officer cut her off. “You stay on THIS side of the chain—that’s why it’s there. Move NOW,” he said again. It was just then that I saw bad memories on my mother’s face, and a growing defiance on her face as her lips began to curl. And in that instant, I imagined our perfect family trip ending in jail some kind of way. We coaxed Mom away from the police officer just in time. Mom got her soil—from a nearby tree where the soil was softer and easier to scoop. A kindly park ranger had pointed the way. My mother’s pharmacist, who became a family friend and then a guardian angel, Dr. Lee Dunaway, helped my father plant a tree in her yard with that soil. Mom got her wish. Just as she got her wish to move back to Gadsden County. She’d felt a strong urge to go back home. And now, in every way, she is. We all sang to her and stroked her when she left this plane, but she is here in our hearts, in our minds, in every atom of our being. She is the voice I will always hear when I face an ethical dilemma. She is the voice I will always hear when I ask myself if I’m doing enough as a parent. I will stand tall, just as you taught us—and I will walk.